Most of the hardwood forests in Vermont contain a mixture of many different types of trees. 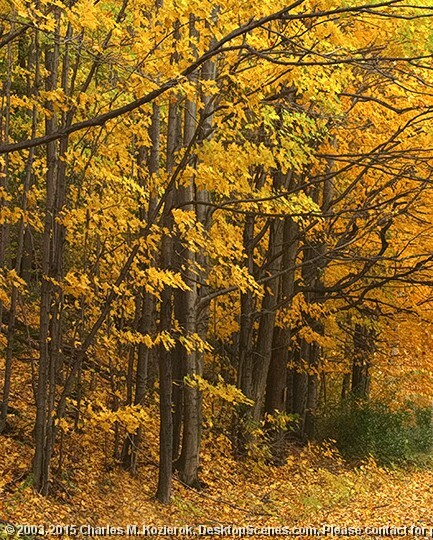 Even when there is a stand of many identical trees, they often change colors at different times, which is what causes the typical fall scene of many different colors and shapes of trees. It is perhaps that normal heterogeneity that caused me to be attracted to this somewhat unusual stand of young maples, all of which had leaves turning brilliant shades of gold and brown. This image was taken off Carpenter Hill Road, in the highlands between Pownal and Bennington in extreme southwestern Vermont.